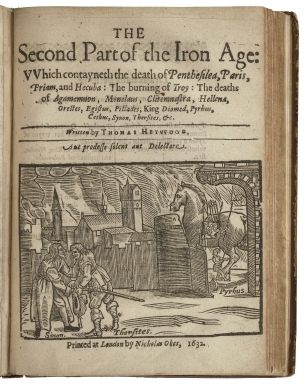 THE Second Part of the Iron Age: Which contayneth the death of Penthesilea, Paris, Priam, and Hecuba: The burning of Troy: The deaths of Agamemnon, Menelaus, Clitemnestra, Hellena, Orestes, Egistus, Pillades, King Diomed, Pyrhus, Cethus, Synon, Thersites, &c.
Title page imaged from Folger call number: STC 13340 Copy 1 Bd.w. STC 13325 Copy 1. Image is not from the transcribed copy.